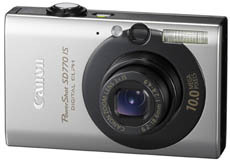 The Canon Powershot SD770 IS (IXUS 85) (announced March 12, 2008) is a 10 megapixel point and shoot camera featuring a 3x zoom lens (35mm – 105mm) and a 2.5 inch PureColour II LCD display. The Powershot SD770 IS also features face diction, enhanced lens shift optical image stabilization, DIGIC III image processor, and 18 shooting modes. The Canon Powershot has dimension of 86.0 x 54.0 x 20.4mm (excluding protrusions) and weighs 150g. It is expected to hit stores mid April with an estimated price of $299.99. The PowerShot SD770 IS Digital ELPH camera’s classic box and circle design has characterized the Digital ELPH look for more than a decade. This 10-megapixel model boasts the thinnest body of any optically image stabilized ELPH model ever produced, featuring a slimmer yet higher capacity battery pack, that with the camera’s power-saving improvements, actually increases the number of photos that can be taken on a single charge to approximately 300 images. Among the key features of the PowerShot SD770 IS Digital ELPH camera are a 2.5-inch PureColor LCD II screen and an optical viewfinder as well as the same optically image stabilized 3x zoom as its more senior sibling, the PowerShot SD790 IS Digital ELPH camera. The PowerShot SD770 IS Digital ELPH camera is offered in the classic matte silver finish with high gloss highlights around the lens barrel and topside edge, and the reprise of Canon’s sleek and striking two-tone finish that incorporates matte black highlights around the lens barrel and circle along the camera edge.